Click here to see Mike Mentzer posing with a rock band a week before the 1979 Mr. Olympia. In this historic Olympia DVD presentation, we have gathered together our rare and mostly previously unseen Olympia segments that were shot on super 8 film in the Golden '70s. We finally obtained the wonderful and fantastic quality 20 minute film from the 1979 Mr. Olympia. See Frank Zane in his all-time best condition defeating Heavyweight winner Mike Mentzer to win the Overall Olympia crown. This footage from 1979 is outstanding quality, given the technology of the time. The rest of the footage varies from OK to good, but please do bear in mind this is rare, historic, old footage shot on super 8 cameras - in theatres that often were not providing TV lighting such as you find today! Although the photos used on the DVD cover are all classic B&W photos, the DVD and Download are 95% FULL COLOUR footage. These are not complete Olympias but consists of the only known highlights footage shot on film at these famous contests. All of the 3 1979 contests are exceptional quality as mentioned. Wayne’s 1971 Olympia footage from Paris is short and extremely rare, and includes Arnold winning his 2nd Olympia, plus the 2 guest posers Sergio Oliva and Franco Columbu. In 1974 see the titanic battle between old rivals Arnold and Lou Ferrigno with Arnold coming out on top. In 1975 in Pretoria, South Africa it was Arnold once again over Serge Nubret and Lou Ferrigno, with Franco taking out the lighter class. Arnold retired after this contest. However he made a Comeback in 1980 to win his 7th Olympia title. 1979 it was back in Columbus where Frank Zane took the overall title from Heavyweight Class winner Mike Mentzer. An absolute feast of posing for Zane fans. Some of this old film footage has had the colour deteriorate with time. However the bodies we show portray priceless images of our great champions of the sport. This is a "Legends of the Olympias of the 70s" DVD. All shot on super 8 film and digitally transferred to DVD with copyright free music added. We have a number of other DVDs which feature Arnold Schwarzenegger, Frank Zane, Serge Nubret, Al Beckles, Roger Walker, Mike Mentzer, Dennis Tinerino, Chris Dickerson, Danny Padilla, Carlos Rodriguez, Tom Platz, Richard Baldwin, Ron Teufel, Jusup Wilcosz, Ray Mentzer, Dave Draper and Reg Park. To find them please put their names into our Search Mode by clicking here. 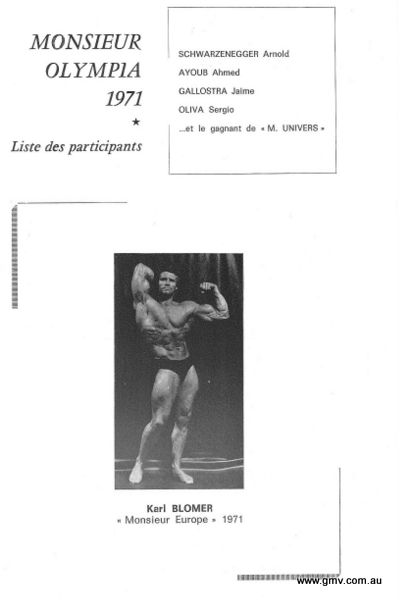 Mr. Olympia - The Golden Years: 1971, 1974, 1975 and 1979, a brief review by Dr David New. I received my copy a short while ago. Here are some initial thoughts. 1979 Olympia. Excellent picture quality. Zane was in a class of his own. Mentzer also looked great. If either one of them had turned up to the 1980 Olympia looking like that there might have been a different outcome. 1975 Olympia. Released before but just serves to highlight how small Arnold was compared to ''71 and ''74. 1974 Olympia prejudging. Goodness me! Arnold was huge! Whether posing or walking on stage. Lou looked great too but overwhelmed by Arnold. Zane was also in great shape and unlucky not to beat Franco. The video quality isn't great, with some unusual colours and it looks a bit foggy. 1971 Olympia. Arnold was incredibly wide and thick, although his legs were better in ''74. I'm afraid Sergio (seen guest posing at the 71 Olympia) and Bill Pearl would have been trounced had Arnold entered the NABBA Universe in 1971. 1979 IFBB World's. Bannout was in a class of his own, and probably never looked that good again. Overall, a "must have" DVD for followers of this period. This remarkable DVD is our tribute to FRANK ZANE and his life in bodybuilding. Frank is regarded as having the most desirable physique of all time. His physical perfection, symmetry and condition is representative of what bodybuilding truly stands for. Frank is still in great condition today at the age of 70. Apart from the 73 minutes of early contest and outdoor posing footage of Arnold and Franco, the bonus material from this collector's DVD includes more recent out-takes, on-stage and behind the scenes video from the Arnold Classic. See approximately 109 minutes of Arnold. In 1980 Arnold made his comeback in Australia at the Mr Olympia contest held at the Sydney Opera House. It was to be Olympia victory # 7. See his solo posing, many comparisons, compulsory poses and more as Arnold once again stands victorious. Includes scenes of many of his closest rivals from Mentzer to Zane etc. A tour de force with Arnold, since voted the most popular bodybuilder of all time. 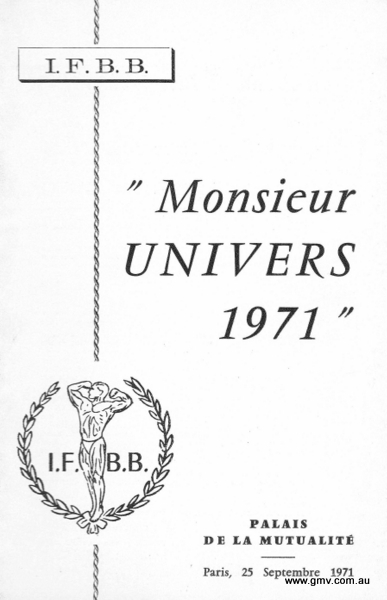 To read the John Hansen & John Corlett's reviews and '74 contest report click here. All 1979 footage shot by Joel Fletcher and licensed to GMV Productions. All other footage Wayne Gallasch. Arnold Schwarzenegger was the only genuine competitor. Although some reports said Arnold won unopposed, the guy who placed second to Arnold in the 1971 Olympia was the little known Ahmed Ayoub of Lebanon. Sergio had been banned and so Ayoub was the only other competitor to appear on the Olympia contest stage. CLICK HERE to see the VICTORY PHOTO OF ARNOLD. PLUS MY CONTEST REPORT FROM "PEAK" MAGAZINE.